Surrounded by the saltwater of the Mediterranean, Enrico learned about fishing in his native Sicily before he could walk while watching his father and uncles catching dinner. Gaudy chicken feathers that seemed to attract some of the largest fish especially intrigued him. But his passion for fishing remained latent while he was urged to pursue a career in the culinary arts. He worked as a chef in a hotel in Sicily where he eventually met his American wife, Karen. He continued to work as a chef when he arrived with his bride in the United States in 1980. Even though he was bound to the kitchen, he still found time to explore fishing opportunities here. With Karen's help he learned about fly fishing at the Connetquot River State Park Preserve on Long Island, and other New York State streams. That summer, Enrico hooked his first trout and that instilled in him an insatiable thirst to understand why fish "eat" artificial flies. "Daddy, that looks like the fish in our fish tank." "Yes, I know," said the father. "That's why it catches fish!" Over the winter, Enrico forces himself to read English by subscribing to fishing magazines and reading books on fly fishing. He also discovered Orvis and fly tying. It was, he says, a watershed experience, and incidentally, quite different from the creation of the crude artificial flies he has constructed from his mother's chicken feathers on snelled hooks. Since that year, Enrico has expanded his knowledge of fish and the reasons they are attracted to artificial. But something kept drawing him back to the sea. So he took the knowledge he had recently accumulated about fresh water fishing and added it to his earliest memories about catching saltwater species. He then took to fishing several local Long Island beaches. He opened The Practical Fly Shop in Little Neck, NY in 1992, where his customers encouraged him to create many of his innovative flies. That led him to experiment with more durable synthetic and natural materials to create flies that eventually became part of the catalog of offerings that are now marketed through Enrico Puglisi Ltd. as EP™ Flies and EP™ Fibers. 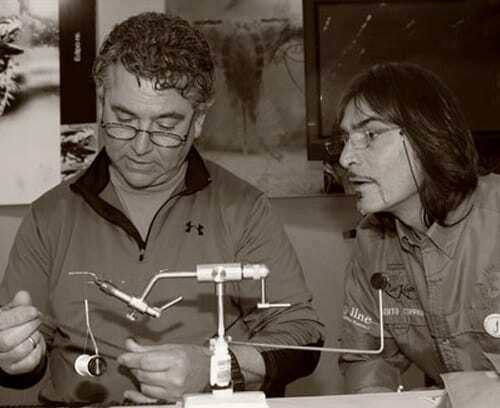 Today, Enrico no longer maintains The Practical Fly Shop, but through Enrico Puglisi Ltd., his innovative products are making a major impact on the future direction of saltwater fly fishing. 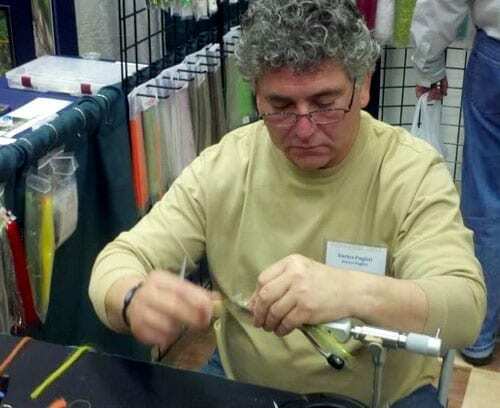 His unique hand-tied flies are recognized around the world, and he has been invited to demonstrate his meticulous tying techniques across the United States and Europe. 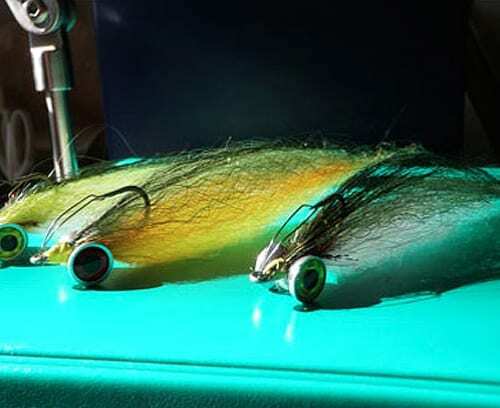 All of his patterns are designed to match specific baitfish and to be eminently fishable. Recently, while appearing as a featured guest tier at a major fishing show, a youngster standing with his father pointed to one of Enrico's creations and said, "Daddy, that looks like the fish in our fish tank." "Yes, I know," said the father. "That's why it catches fish!" That was a proud moment for Enrico because that's what he wants to create for his customers -- flies that catch fish!